I am glad Arrow went through a bit of a reinvention this past season. New faces bring a new enthusiasm to the script and storyline and we are constantly reminded in Season Five that not only is the team simply human, but Arrow is simply a man. Warner Bros. and DC Comics have created a cult culture following that I want to be a part of. More importantly, I want my kids to be a part of this cult culture. Between the two mega companies, they have brought comic book characters to life in a way that the Saturday morning cartoons of the 1960's and beyond failed to do. They have made the Superheroes real flesh and blood, with real relationships that we can relate to and sometimes see ourselves reflected in their storylines. Arrow was the first "real life" television shows in the 21st century to captivate an audience as it has continued to do so over the past five seasons and while Arrow is still on the darker side of DC, it is still a show I can watch with my pre-teen kids. What's interesting is that Arrow, now the Green Arrow (aka Oliver Queen), was just a rich boy who was lost at sea. Throughout the series, we have been privy to flashbacks of how Queen became the Arrow - moving from circles of money and partying to a life wherein he felt responsible for the welfare of his entire city. The Green Arrow is not so much a Superhero as he is a vigilante but, nonetheless, you cannot help but fall in love with the calm, cool, collected, and handsome Stephen Amell (Teenage Mutant Ninja Turtles: Out of The Shadows). Despite his upbringing, he has been molded into a rough and gruff assassin at night but by day, he is the Mayor of Star City - clean, handsome, and charming. Season Five gives the audience more insight into Queen's background and his vulnerabilities. One of the main antagonists turns out to be a confidant of the Mayor's, Adrian Chase (Josh Segarra; Trainwreck), whose alter ego is Prometheus. Prometheus challenges Green Arrow, and ultimately Oliver Queen, in a way unseen in prior seasons. We also see a culmination of Green Arrow's weaknesses in a way never presented previously. Normally, Green Arrow becomes more determined and harder with every villain he brings down but Prometheus almost breaks Green Arrow- or more specifically- Oliver Queen. For the first time, a villain cracks Green Arrow that shows the viewers the human man behind the hood. We are reminded that despite the huskier voice Green Arrow uses on screen or the difference in attire they wear, Green Arrow is simply a man with the same issues everyone else has. Season Five brings in a whole group for Team Arrow. Going for quasi-thug type characters, the team has crude looking outfits instead of tailored outfits like Green Arrow or even Speedy. Their dynamic is rough around the edges and we spend much of the season getting to know the new characters and new storylines as well as getting to know everyone's relationships all over again and it is invigorating to watch. Throughout the Season, we also learn about the new team members' personal lives, quicker than we did with the prior characters. By far, introducing so many new characters and rebuilding the core of the show could have been a disastrous gamble but, in the end, it paid off and Season Five was a huge hit. Green Arrow can be seen throughout DC's other television shows The Flash, DC's Legends of Tomorrow and Supergirl. Despite his vigilante status versus superhero status, Green Arrow seems more grounded than the others, almost like a big brother or counselor guiding the newbies to where they need to go and how to get there. The others look up to him as a mentor and Green Arrow plays the part extremely well. The cross-over events bring a great dynamic to the series and provide more depth outside of the one story we are watching. 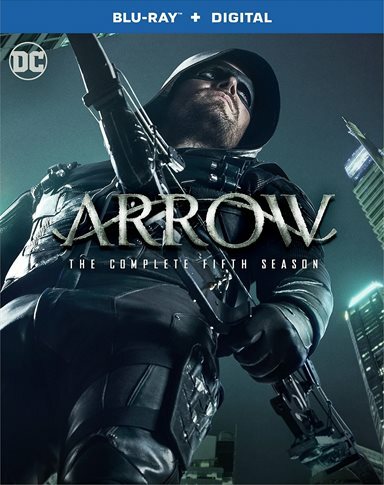 Arrow: The Complete Fifth Season is presented in 1080p High Definition Blu-ray with an aspect ratio of 1.78:1. As befitting Green Arrow's storyline, which seems to happen mostly at night, the background is really dark with overtones of a greenish tinge. Sometimes it is hard to make out the details of a scene but the actors bring the scenes to life so, really, you don't lose much. While in previous seasons outdoor scenes would have a natural brightness to them, I noticed that the outdoor day scenes were still overcast, possibly mimicking Arrow's mood for much of Season Five. The audio is presented in DT-HD Master Audio 5.1, which emphasizes the action scenes without being too overpowering. The audio is appropriate for home viewing and provides a clear and crisp soundtrack for those watching even without speakers or a sound system. There is a lot of movement of the actors this season and despite that, the sound system captures exactly what it needs to, ensuring the audience is involved with all dialogue. The New Team Arrow - Meet the new team as they get prepared to fight alongside with Green Arrow. Allied: The Invasion! Complex (Arrow) – A documentary of what this season has been about- Oliver's vulnerabilities. Personally, I am glad Arrow went through a bit of a reinvention this past season. New faces bring a new enthusiasm to the script and storyline and we are constantly reminded in Season Five that not only is the team simply human, but Arrow is simply a man, with weaknesses that can overpower him just like it can to normal, everyday, non-vigilante audience members. This season also reminded us that when we fall down really hard, there are always friends who will make us get up and carry on, whether we want to or not. Arrow: The Complete Fifth Season is a well-placed investment to have in your home. Download Arrow: The Complete Fifth Season from the iTunes Store in Digial HD.